Welcome to Lookout on Liberty! Large living room to relax in. A mix between antique and bold prints bring life to the space. French doors lead to the balcony. Spacious and light filled! Pocket doors separate the bedroom from the sitting room. Sitting room with television housed in the armoire. 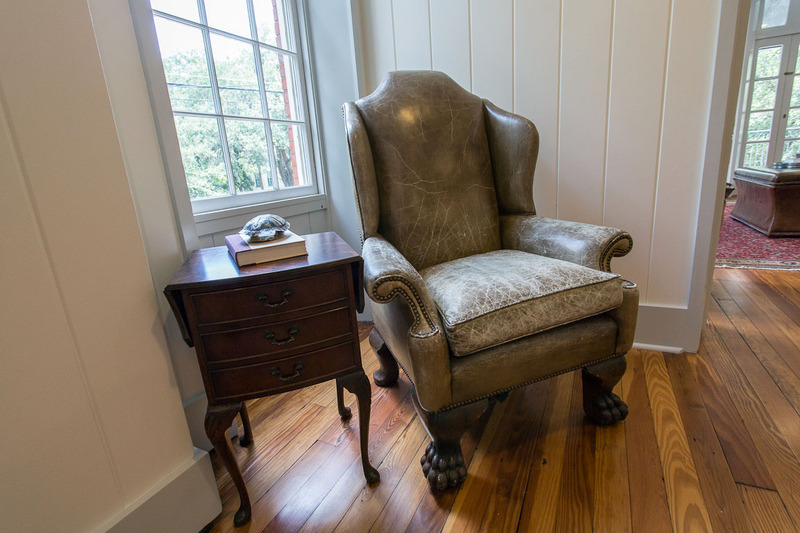 Comfortable wingback chair invites you to curl up with a book. Cute kitchen with granite counter tops. Fully equipped modern kitchen with everything you need to cook. 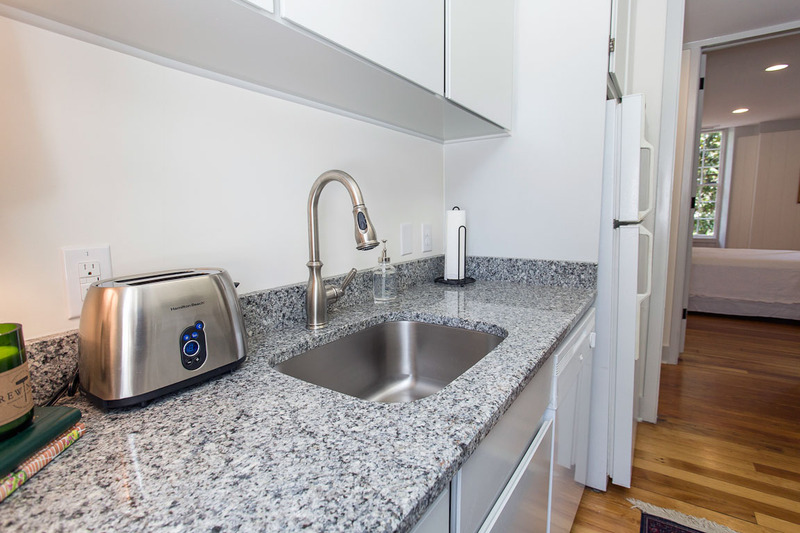 Ample counter space. 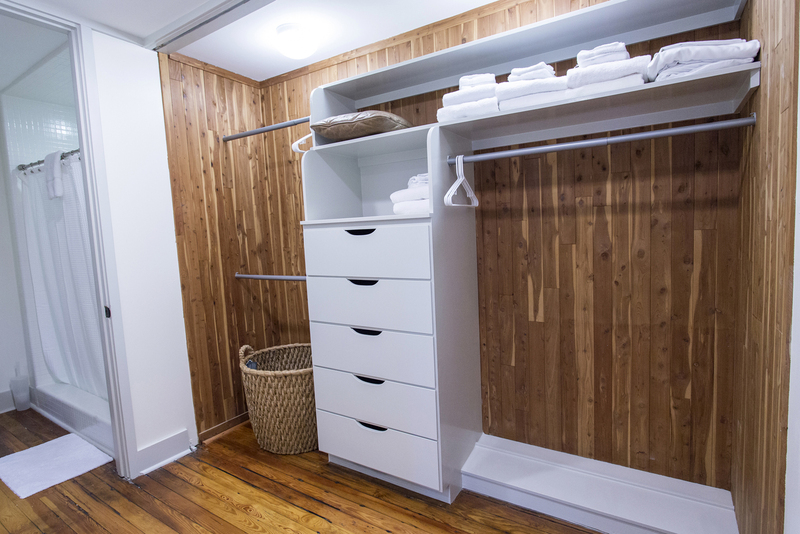 Extra storage for clothing during your stay. The master bedroom with king size bed. The bathroom and adjoining wooden closet. 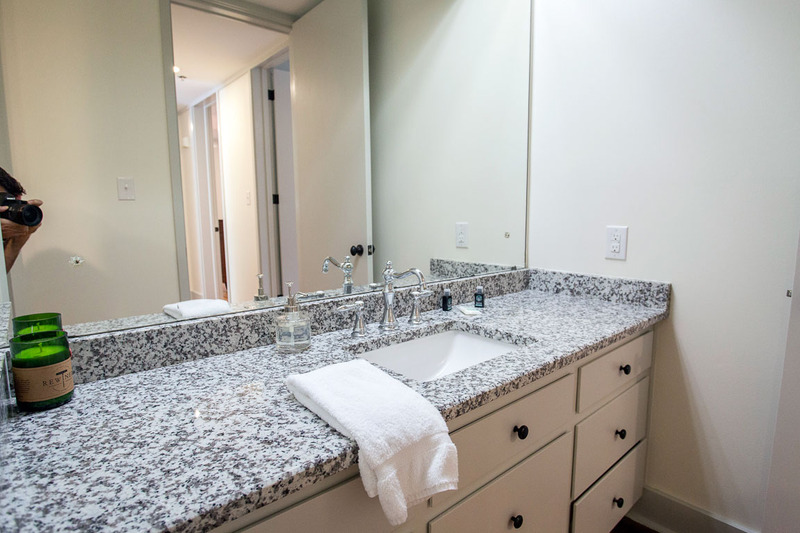 The full bathroom with modern vanity and sink. Huge walk-in closet. The bath has a walk-in shower. The guest bedroom has a Queen size bed. The guest bedroom opens up to the sitting room. Guest bedroom with antique four poster bed. Large balcony for taking in the sights. View from the balcony- a fabulous place from which to watch the St. Patrick's day Parade! 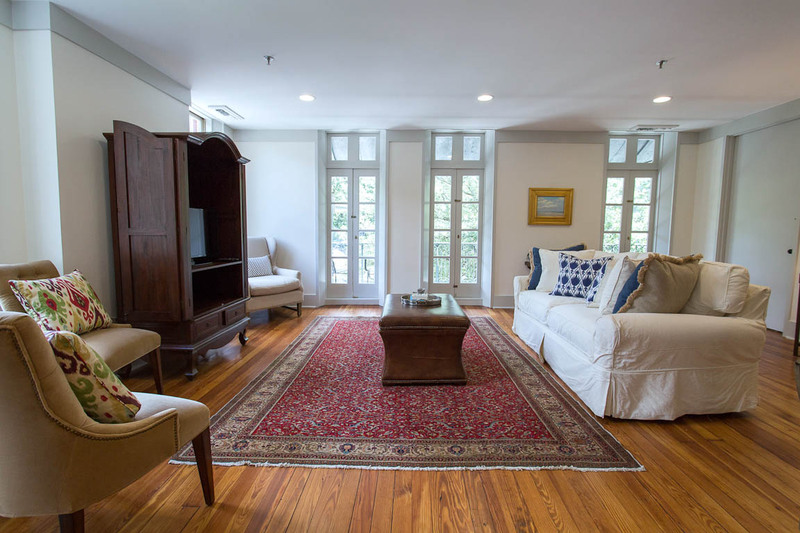 This spacious two bedroom home on the corner of Abercorn and Liberty Streets is nestled in the heart of the Historic District. It has everything you could want in a vacation spot, including a private balcony where you can enjoy a cup of coffee or a cocktail while you watch Savannah in action. 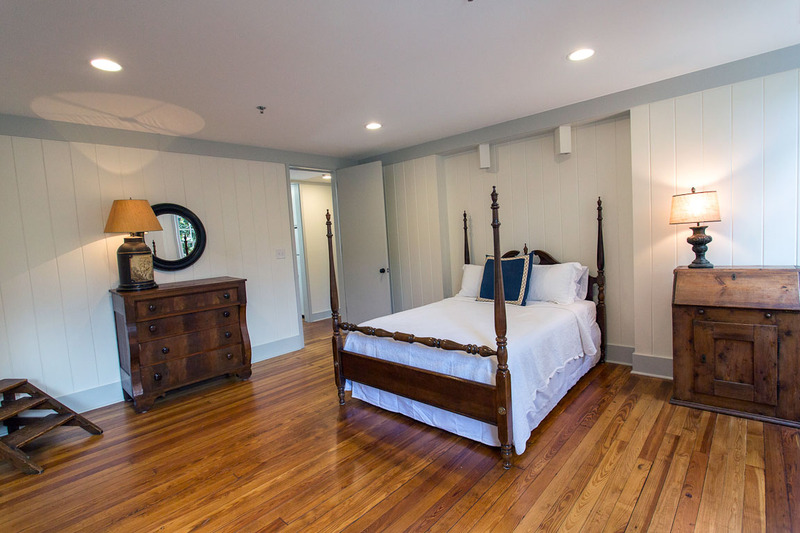 Upon entering the home, you’ll be greeted by beautifully restored wall-to-wall heart-pine floors. Original details remain throughout the space, including French doors that lead to a balcony with wrought-iron handrails and mosaic tile overlooking Liberty Street. 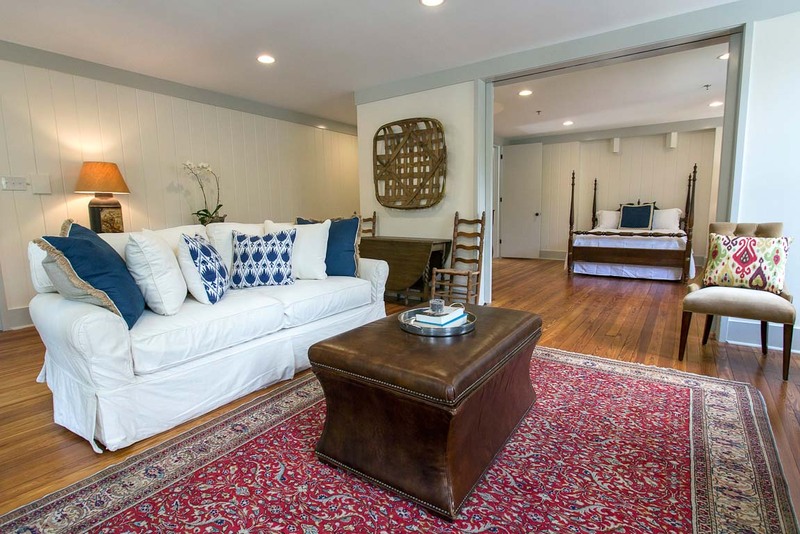 The living room is spacious and light, styled with a mix of antiques and bold prints making it warm and inviting. You’ll have plenty of comfortable seating, including a queen sleeper sofa, and a TV so you can enjoy a long overdue movie night. 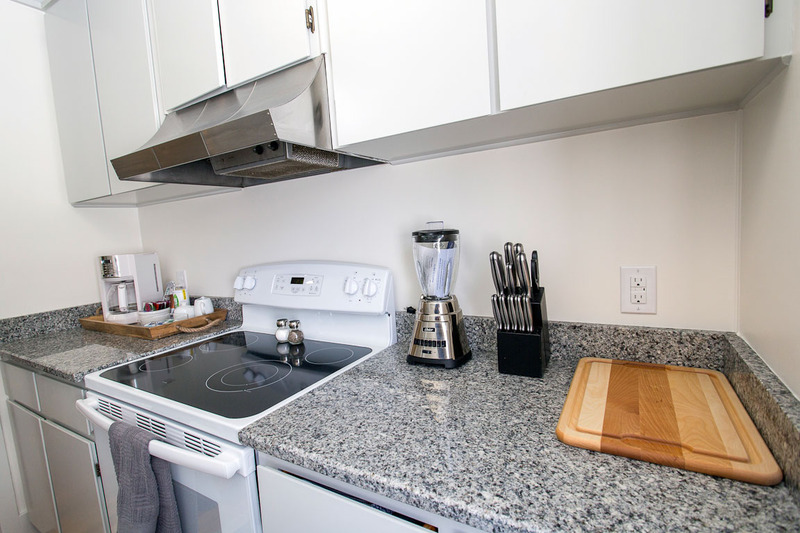 The fully equipped modern kitchen has everything you need to prepare meals when you are not enjoying one of the many nearby restaurants. 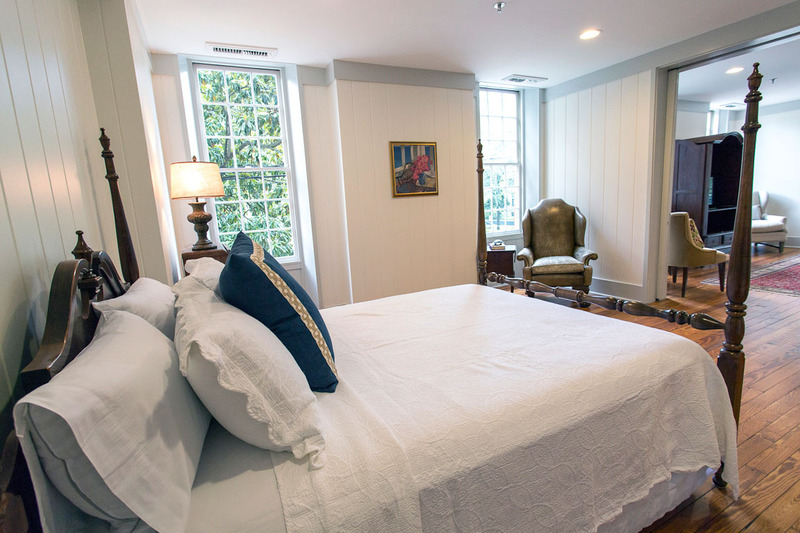 Original pocket-doors separate the living room from the queen bedroom, which has an antique four poster bed and a comfortable wing chair next to the window, perfect for curling up in with a good book. 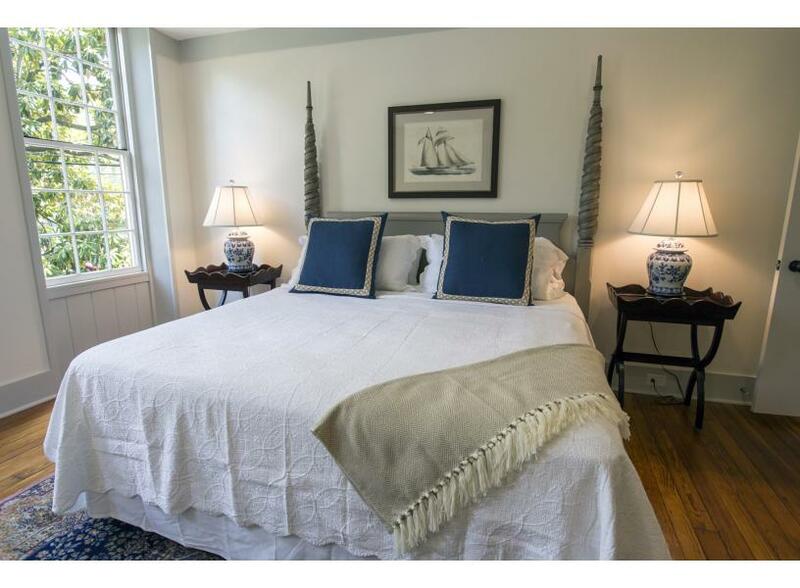 The Master Bedroom is very spacious, and has a King Bed and a huge walk-in closet. 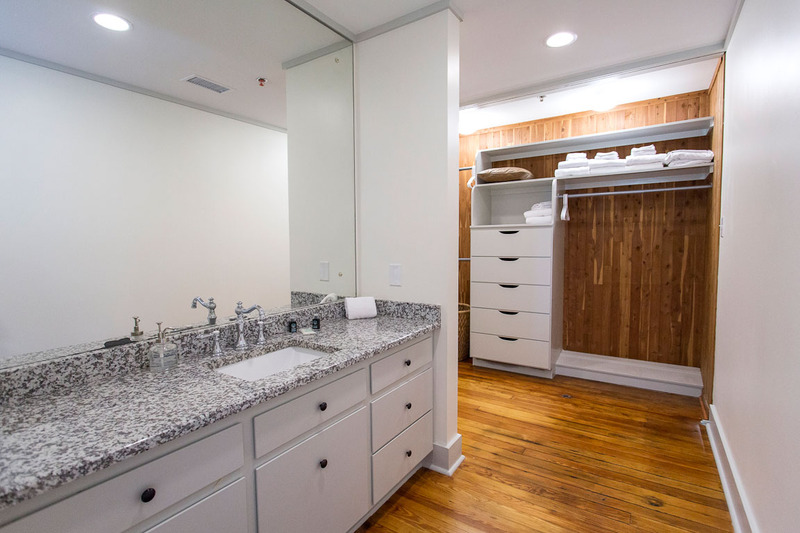 Although this home only has one full bathroom, the Master has a separate vanity with sink that can be closed off from the main bathroom. If you do bring a dog to this pet friendly home, you can both enjoy breakfast downstairs at J. Christopher’s. Known as Fancy Parker's, Parker’s Gourmet Market is just around the corner and open 24hrs. Grab some lunch to go and spend an afternoon in one of Savannah’s many squares or wandering Colonial Park Cemetery, the final resting place of many of Savannah’s earliest residents. - The view from the balcony is perfect for watching the St. Patrick’s Day Parade! 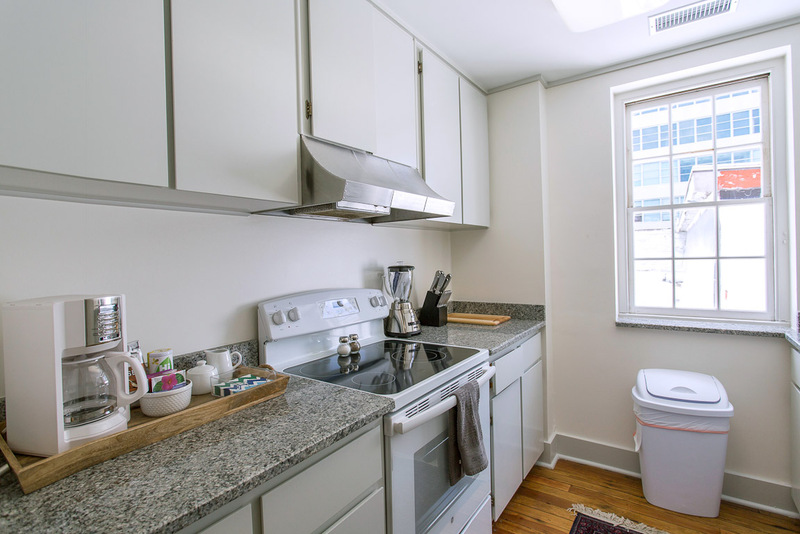 - This studio space is perfect for a weekend getaway and is a in prime location for marathon runners. - Parker’s Gourmet Market is just around the corner and open 24hrs. But compared to other lucky Savannah rentals I have stayed at, this one was lacking any charm. Decor was minimal, supplies were sparce. The sliding doors to the bedroom were broken. It was fine, but not to the level of “hominess ” that I expected from a lucky Savannah rental. We really loved it. It was walking distance to great sight seeing, great restaurants, and great shops. Fantastic breakfast right downstairs. We enjoyed sitting on the balcony and people watching although it is a bit loud out there during the day with traffic, it was fine at night. The beds were comfy and the whole place was well outfitted. We will try to stay there again when we are in the area. Very clean and excellent location. Lookout on Liberty is a great place. Lots of room. Nice furniture, great beds. The balcony is a great feature. Will stay here again. Great place to stay in Savannah! Close to everything including the DOT. We had an absolutely delightful stay at the Lookout on Liberty. 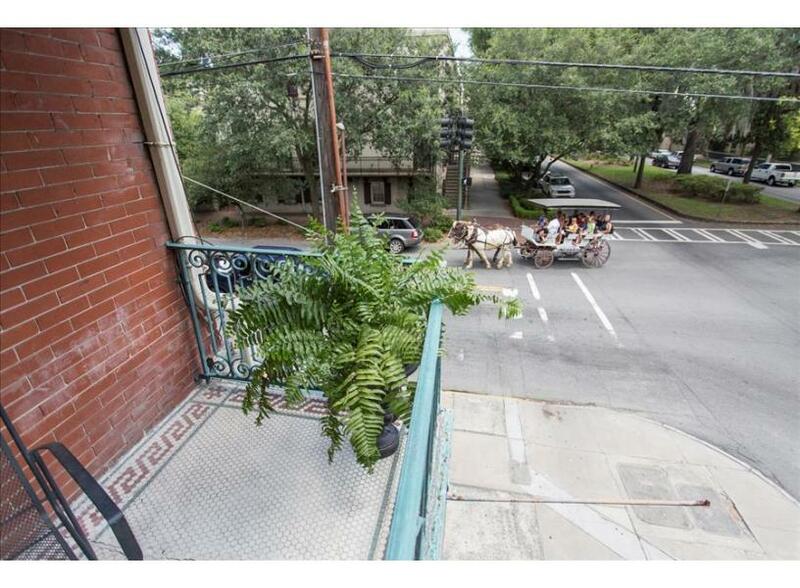 Being so centrally located, with the added benefit of the balcony, made our holiday stay in Savannah a dream. Would highly recommend! We look forward to hosting you again soon Michaela! 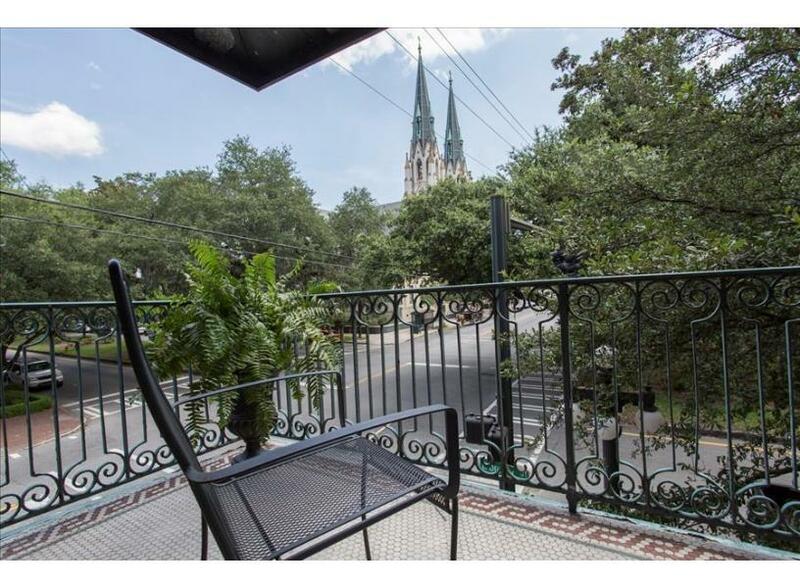 If you are interested in staying in the historic district then Lookout on Liberty is a great choice!Beautiful property with a balcony that is great for enjoying the view! It is also pet-friendly so our dog felt right at home! It was exactly what we wanted and expected and I highly recommend it! Hi Camille! Thanks again for choosing Lucky Savannah. Lookout on Liberty is in a fantastic location, and we're so happy to hear that your #luckypup felt at home. See you again soon! The unit was so cool! Clean, attractive, good arrangement for the four of us. Original flooring was beautiful. Enjoyed the balcony. Street noise was an issue at times. Walking distance to downtown was 10 minutes. Nice to be out of the downtown hubbub. A pocket door between the sink area and the toilet/shower room would be nice. 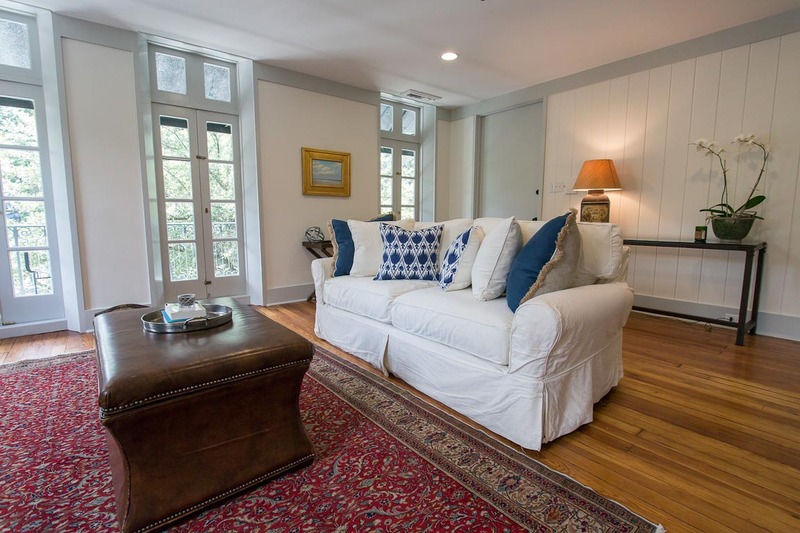 Fabulous Savannah rental, convenient to everything! Beautiful apartment with classic Savannah style. Great location that is walkable to everything. Loved the balcony for relaxing at the end of the day. Highly recommended! This was a comfortable large space perfect for a girl's weekend. Two separate vanities make the bathroom situation ideal for families or couples. The location was amazing, close to everything (visit Parker's Market around the corner for grocery items and more). The shower head handle was broken upon arrival but we reported it immediately and it was fixed the next morning while we were out (why didn't previous guests or housekeeping report this to management??) Word of advice - due to the location on a busy corner, this unit is NOISY even late at night. We popped in some earplugs and slept fine but if you are sensitive to noise and light then be aware. The balcony was great for people watching, but we could only stay out there a little bit at a time due to the traffic noise. J. Christopher's next door was the perfect breakfast stop before a long day of exploring, don't miss it. Debbie, thank you for choosing to stay with Lucky Savannah! We're so glad you found the unit to be more than adequate for your needs. We'd also like to thank you for making us aware of the shower head so that we could have it fixed immediately for you. We hope to see you again soon! I found this listing last minute and am so glad I did. Location is perfect!! Unit is clean and decorated very nicely. Only complaint, and it's minimal, is the shower head handle was/is broken. Will definitely look for this rental next time I plan to go to Savannah. First visit to Savannah and this was the perfect place to stay! We were in town for a tour of SCAD, and quickly realized we were close to all of the things that we wanted to do while in town, including the trolley stop right across the street. Balcony was great for a view of the cathedral and people watching during our down time, and door keypad was convenient when different people in our party wanted to do their own thing... no key to keep up with! Definitely recommend! Beautiful apartment. Great location. It's within walking distance of almost anything you want to see in the Savannah Historic district. We will definitely stay at the Lookout on Liberty again when we come back. 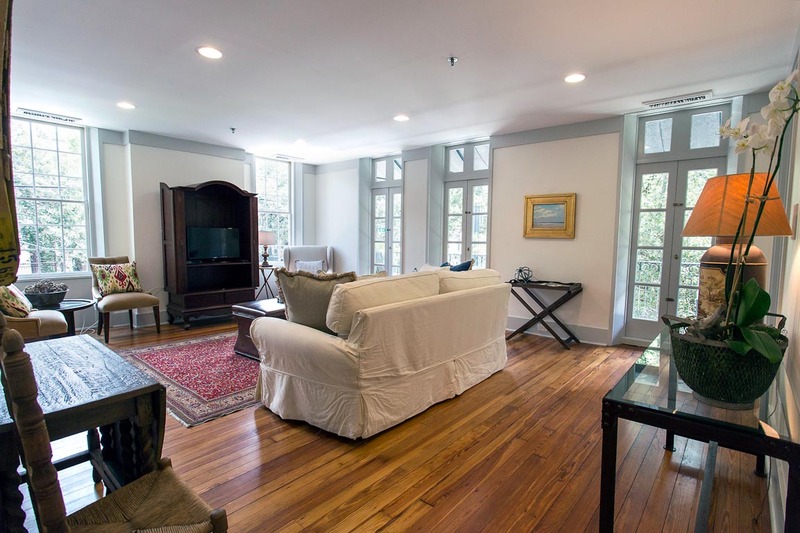 Apartment is perfect for a stay in Savannah. Thank you for choosing to stay with Lucky Savannah! We are so thrilled to hear you all found Lookout to be a perfect place to stay. This apartment is centrally located, in the heart of the historic district, close to many fantastic restaurants and shopping! We definitely hope to have you all again in the future. There were two couples and one teenager and the apartment was very spacious for everyone. Loved the balcony, sitting and watching people and their dogs go by. Easy walking to everywhere and not hard to find a parking spot. Very clean and great beds. Would definitely stay again. Thank you for choosing to stay with Lucky Savannah! Lookout on Liberty is a great option for a small family, or a small group. This apartment allows an ample amount of lighting throughout the home, making it feel warm and welcoming! We are so glad you all had a great time and would like to stay again. Please don't forget about our 10% "Returning Guest" discount! Thank you Lucky Savannah for another great experience! The Lookout on Liberty was everything we could have asked for in a vacation rental. The place was roomy with all the amenities we required. The location was perfect to visit all the Historical District on foot and very close to where our daughter had moved to for her remaining SCAD terms. Your hospitality over the phone was welcoming from the beginning. We even appreciated how quick you responded to our minor issue with wifi and cable via text. We ran into a few of your ladies of the cleaning crew and they were extremely friendly and helpful. I can promise you that we will be using your service again and again in our visits to the city. After an 18 hour road trip, your accomodations make all the stres of the drive disappear. Thank you, again. We really enjoyed our stay at the Lookout on Liberty. The first thing we noticed was how beautifully the unit was decorated, it made for a very pleasant stay. The porch had a great view of the famous cathedral, and it was a fun spot to people watch. We were able to walk to pretty much everything easily. It was extremely easy to check in and out. The unit provided everything we needed for our stay. A couple of areas that could use improving: it seemed that the unit needed some maintenance. There was a broken table on the patio. One of the doors to the patios locks wouldn't work. There were a couple of lamps that didn't work or needed bulbs. The unit also promised liquid soap and the bottles were empty. It also seemed the shower floor wasn't properly scrubbed. The kitchen was a bit small, so if your looking to cook bigger meals while you stay it might be an issue. It was otherwise perfect for quick meals and refridgeration for our cold items. The unit also lacked a real place to sit and eat, so again bigger meals would be a challenge. Those issues to me were minor, and I would definitely recommend staying here to anyone visiting Savannah. Girls weekend was a success, everything was in walking distance and we had a comfortable place to stay and cook! My wife and I had an unbelievable weekend at Lookout on Liberty. It was a great set up and beautiful old place, but more than anything the location was perfect. Every morning we able to walk over to Forsyth Park for a workout then hit up Collins Quarter or J Christophers for breakfast. Broughton street is only a couple blocks away, which was a great way to spend the afternoon. Each night we walked to a restaurant and just had a wonderful time. It was really nice being able to park your car on arrival and not have to touch it again until we were leaving. We're already talking about doing this again next year. Hi Lat! Thank you so much again for choosing to stay with us. We're so glad to hear you enjoyed Lookout on Liberty and our beautiful city. Please know that you're privy to our Friends and Family discount next time you stay with us. Looking forward to hosting you again soon! The property was certainly adequate, but still had a few issues I noticed from previous reviews. I might have been spoiled by a previous property I rented :) Overall a good vacation! Hi Wanda! Thank you so much again for choosing to stay with us. We're so glad to hear you enjoyed Lookout on Liberty. Please know that you're privy to our Friends and Family discount next time you stay with us. Looking forward to hosting you again soon! We love Lookout on Liberty. The location is perfect and the view from the balcony is amazing. We hope to be back soon !!!! Hi Gary! Thank you so much again for choosing to stay with us. We're so glad to hear you enjoyed Lookout on Liberty and look forward to hosting you again soon. Altogether positive, except that the code for the door of our apartment was wrong. We had to call for help. She arrived promptly having already given us another code which worked and got us in. Minor matter. Would have liked a teapot in the apartment. Also minor matter. Otherwise, very satisfied with our stay. But for these minor matters, all my ratings would have been 5 stars. Hi Patrick! Thank you for choosing to stay at Lookout on Liberty. We do apologize for the code issue and are happy to hear that our staff was responsive and helpful. Looking forward to hosting you again soon! We absolutely loved this place! There is an excellent breakfast place directly below the unit that we ate at almost every morning and if you want something different there are plenty of breakfast places within walking distance. We loved the balcony! We would get a glass of wine or coffee then sit out there and people watch. Liberty street is a perfect location, in my opinion, for a getaway. It's close enough to the River Street (15-20 min walk), but far enough away that you do not get the noise of that crowd. It is very spacious for a 2 bedroom! You will not feel cramped at all. I highly, highly suggest this unit! Thank you for such a great Savannah experience! Thank you so much for the kind words, Megan! We look forward to hosting you again soon. Wonderful location, loved the balcony and appreciated the late checkout with no additional charge. Thanks again for choosing to book with Lucky Savannah, Heather! We look forward to hosting you again soon. Terrific location! Clean, roomy, easy access. Seperate vanity rooms for one bathroom was really helpful! Would have liked a kitchen/dining room table. Hi Tina! Thank you for booking with Lucky Savannah Vacation Rentals. We're so happy to hear that you enjoyed the location and cleanliness of Lookout on Liberty, and appreciate your suggestion! This experience was even better than expected. If you love to sit on a balcony and people watch, stay here! If you want to be in walking distance of everything, stay here! The home is beautiful- no comparison to a hotel. We had the best time!!! Hi Cristy! Appreciate the kind words surrounding your recent stay at Lookout on Liberty. You can't beat the view! We normally visit SAV around T-Give and end of Feb. This year went to spend New Years Eve. Great Choice!! Weather was warmer than Missouri for sure. Location was fantastic for what we wanted to do, which included City Market and River Front. House was REALLY nice overall. Fit what we wanted. Have rented many times in SAV and Tybee and always seems to be perfect. Spacious, clean, well-appointed apartment in an excellent location. Very comfortable. Did not move the car until we left. Is good for a small family of 3 or 4 or for a "girls weekend" with good friends. Easy check in and out. We had a great week staying at Lookout on Liberty. We were in town for a combination of business and pleasure. This condo was nicely furnished and in an excellent location. Our days began right next door with breakfast at J. Christophers which had excellent service and great food! During the day we easily travelled around the area to various meetings. 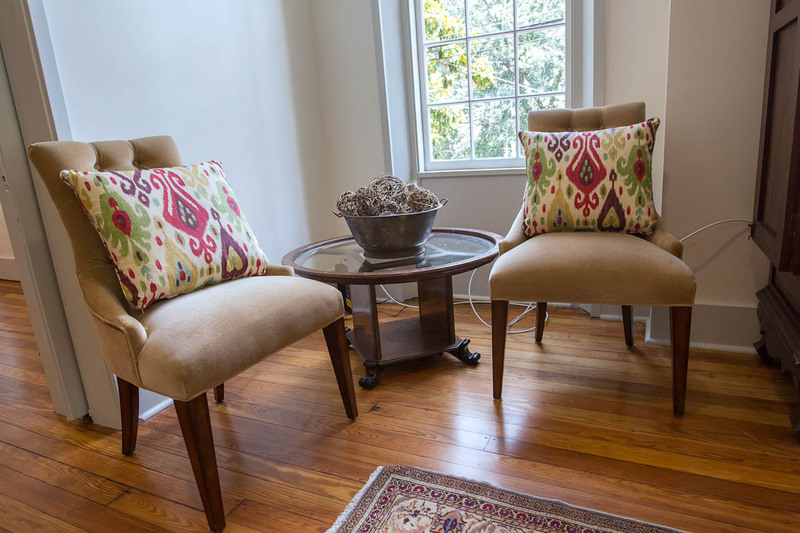 We would come home in the afternoon to relax and regroup in total comfort before heading out for a great dinner at one of Savannah's great eateries that were within walking distance. The condo is well furnished and the beds were very comfortable! There is a bit of street noise because the corner of Liberty and Abercorn is busy but it settled down for the most part around midnight. If you are a light sleeper it might cause some issues but I always travel with earplugs which were a big help! 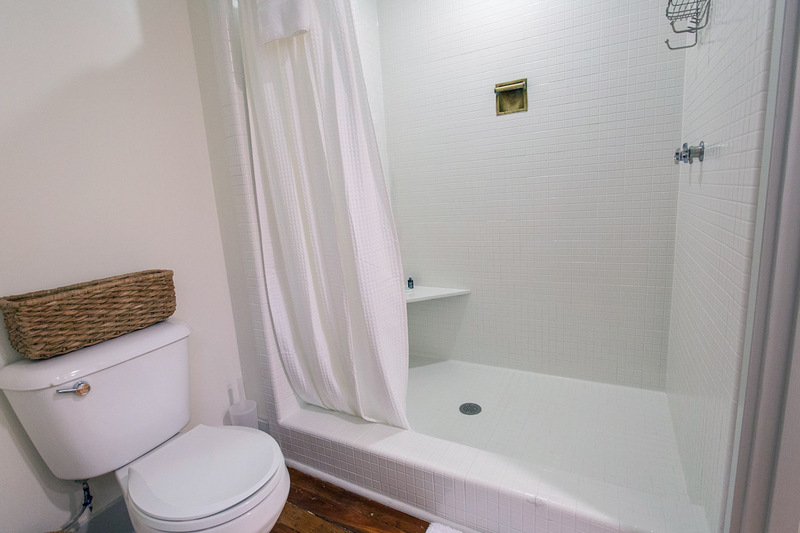 I would also point out that if you are looking for two couples to share this condo you need to be aware that while there are two separate bathroom sink areas there is only one shower/toilet area adjoining these areas and only one of these areas is separated by a door. There is also only one closet which is off the master bedroom. It would be fine for a family or perhaps girlfriends but might not work as well for two couples. It could also use some towel racks as there was no place to hang towels to dry. We loved our apartment. The location was perfect though we could hear pretty much all of the street action. It was nicely decorated and well-stocked including enough towels for 4 girls!! Appreciated the coffee. We had an incredible time, perfect location, perfect space, really well decorated and furnished !! A very spacious, well equipped and the most importantly very clean apartment. Well located if you are visiting SCAD, and great at graduation time. Parking was not a problem. Very friendly and professional management. We will recommend it at any time. We had a great time! The unit is so beautifully furnished! We loved the balcony overlooking the action. The noise level wasn't really that bad as someone else mentioned. We also enjoyed the breakfast/lunch place next door. Street parking can be tricky but if you are a walker you can park once and be done with it. I was with my elderly parents so I had to drive to River St. I did use the bike taxi's also. So much fun! Hope to come back soon! We were very thankful the property was exactly as described. It was very clean and believe it or not the only thing we could have wanted was tissues! I would recommend this to a friend or relative. The pointers provided by the management service for dining out were spot on and we really enjoyed the local hangouts. Thank you for staying with Lucky Savannah! 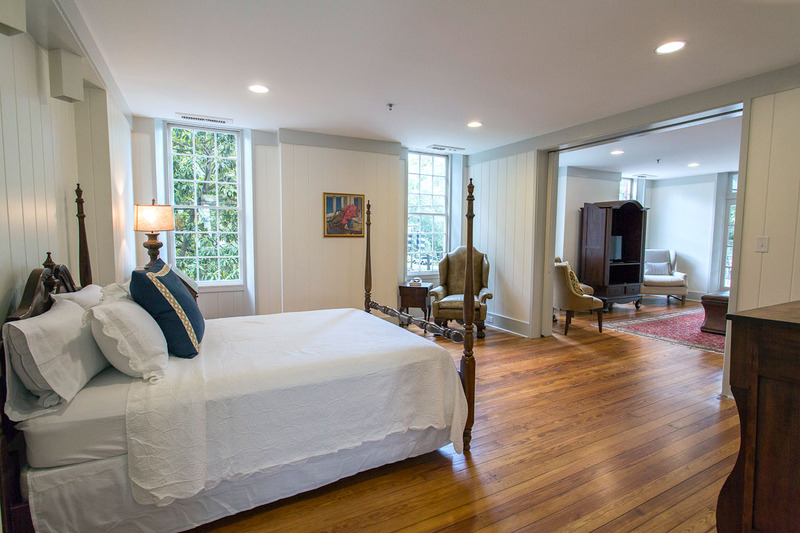 We are thrilled to hear you enjoyed your stay here in Savannah! We hope to have you as our guests again in the near future. Perfect for our Girls Weekend. Beautiful spacious apartment with a location that could not be beat. It was a first time visiting Savannah for all of us and it won't be the last! We visit Savannah two/three times a year and Lookout on Liberty by far has the BEST view. The condo was beautiful on the inside, very clean, comfortable beds and floor to ceiling windows that brought in so much sunshine. We loved sitting out on the balcony which was the highlight of our evenings after spending our favorite time walking around Savannah. It was so convenient to Broughton, River Street, City Market and Bull Street along with some of our favorite restaurants. Parking can be a little tricky but we always managed to find a parking space. It is metered parking but it would be to your advantage to go to the Visitor's Center to get a parking pass if you are there longer than a couple of days. Just remember after 5 and weekends you do not have to pay. Also, pay attention to early morning times for the street sweeper. Lucky Savannah employees are very nice and helpful along with being very quick to respond. 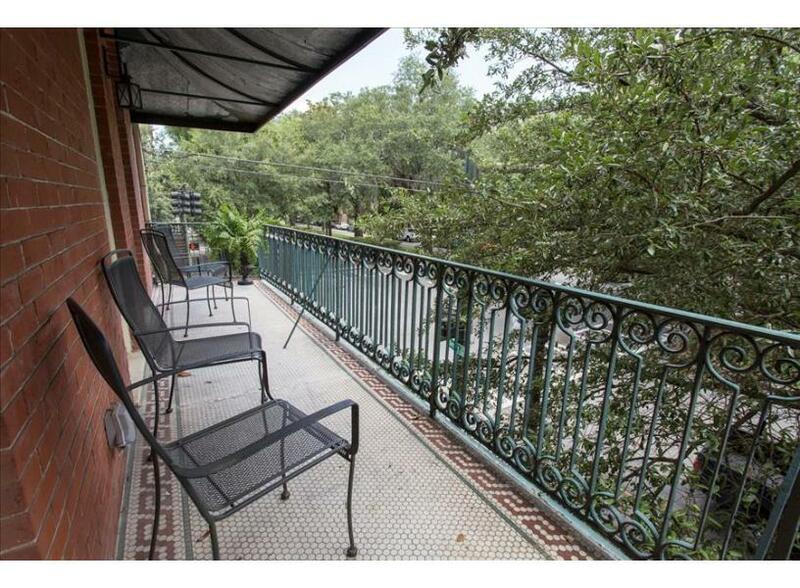 Enjoy your stay in Savannah and you will be happy you rented Lookout on Liberty. I feel sure we will be renting this property again in the very near future. 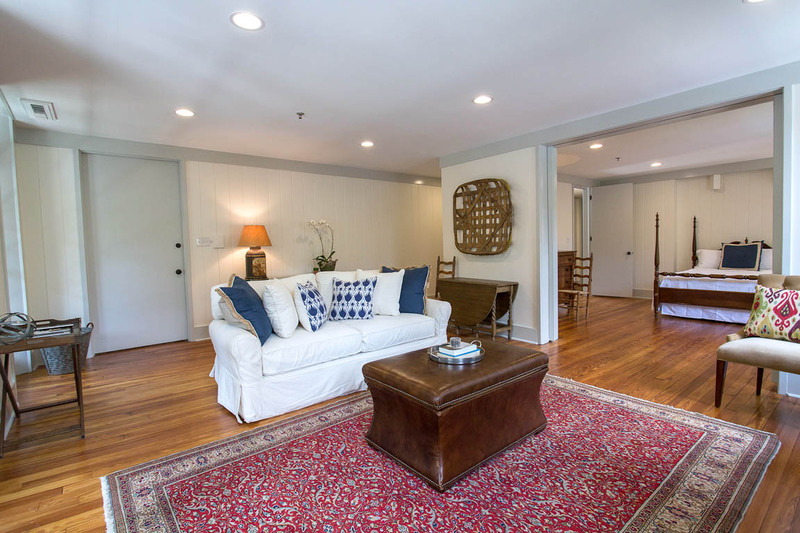 Spacious, air conditioned, beautifully decorated with a balcony overlooking East Liberty. Steps from the Hilton Desoto, Bonaventure Cemetary, pubs and bookstores. Market with deli and liquor selection two blocks. You can be downtown/riverside on foot within 10 minutes and the walk to Forsyth Park takes you through some of Savannah's most interesting architecture. I would stay here again in a heartbeat. Yes the kitchen is small but it is fully appointed and you should be out on the balcony anyway. Lucky Savannah office staff went out of their way on check in to take care of my guest's luggage as she arrived before the unit was ready. Booked this for the balcony view so we'd have something a little different to enjoy. The view certainly didn't disappoint. Overall the unit was very spacious and clean. 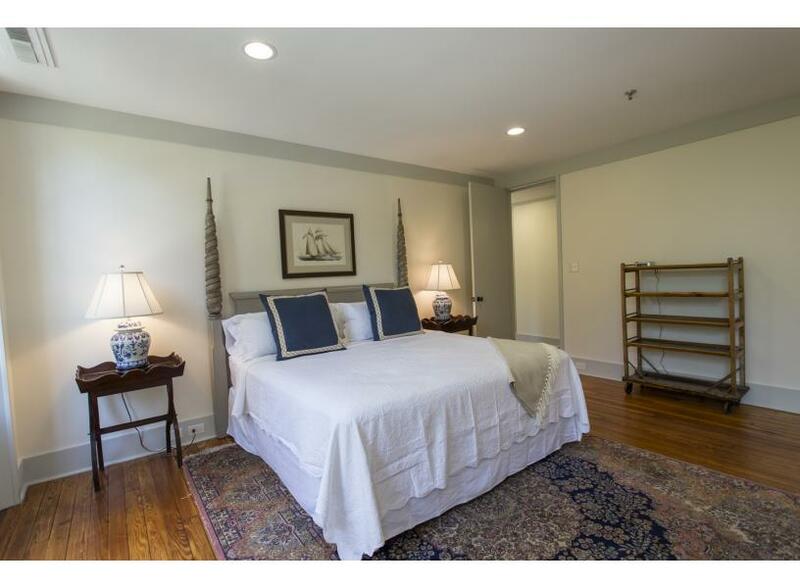 Big master bedroom, large closet, and two large vanity areas apart from each other for extra space. Right next door is JChristopher restaurant which has good food for breakfast. Only downside is that Liberty street is a very busy street. Great for people watching from the balcony, but if you're a light sleeper then this isn't the place for you. Not a huge deal but the toilet was also a little wobbly and needs to be adjusted. Thank you for choosing to stay with Lucky Savannah! We are so glad you were able to enjoy your stay here in Savannah. The balcony makes Lookout on Liberty great for people watching, and just enjoying the weather! We are happy to hear the home was spacious and clean for you all. We hope to have you as our guests again in the near future! We also thank you for brining this to our attention, and have had maintenance look at the toilet. 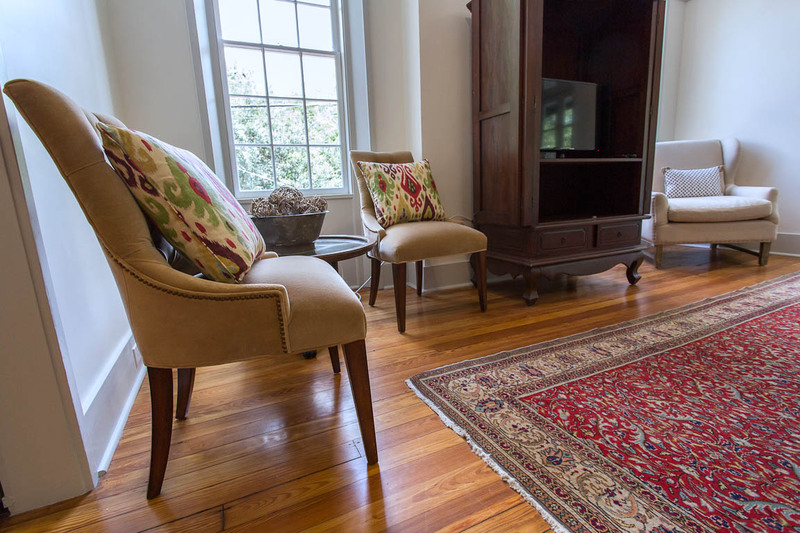 Location is great and the home is comfortable with fine furnishings. Will definitely be staying here again. Thank you for choosing to stay with Lucky Savannah! We are so thrilled you found Lookout on Liberty to be in a great location. 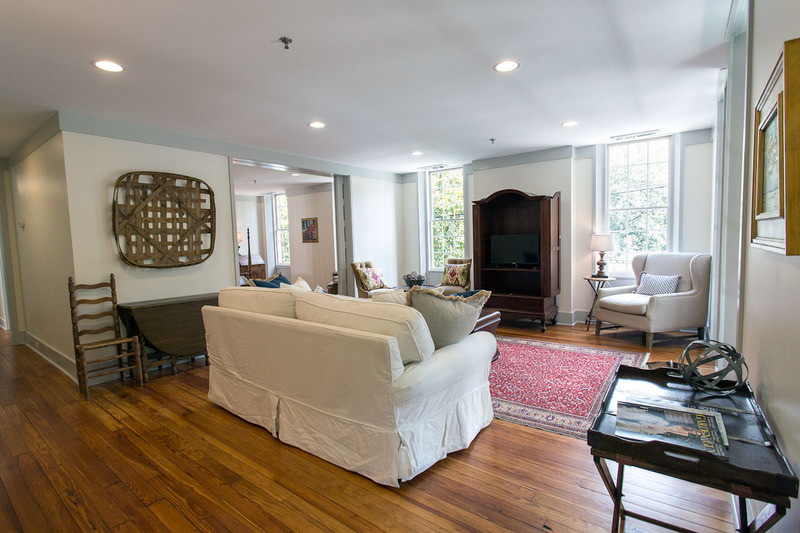 This apartment is only two blocks away from Broughton Street, and fairly close to many great restaurants! We are happy you all enjoyed your stay with us. We can't wait to have you all again!